Introduction - The handicap system is designed to bring equity to the competition between individual competitors. Many competitions, however, are based on team performance (four-ball, foursome, scramble). The problem then is how to combine individual handicaps into team handicaps to make for fair competition. The United States Golf Association (USGA) has made recommendations on handicaps for different formats. The USGA, however, has not published any empirical research validating its recommended team handicaps. Moreover, USGA recommendations are not internally consistent. In four-ball match play, the USGA recommends teams play at full handicap. In four-ball stroke play for men, however, handicaps are reduced by 10 percent. For women, the recommended reduction for four-ball stroke play is only 5 percent. It would be difficult to justify on theoretical grounds why four-ball match play should be played at full handicap while four-ball stroke play should be played at 90 percent of course handicap. There is also nothing inherent in the handicap system that could explain why men and women should have different handicap adjustments in four-ball stroke play competition. This paper presents a methodology for the empirical verification of the equity of a handicap procedure. The methodology is applied to the case of four-ball stroke play. This examination is structured along the lines of the questions it intends to answer. First, is the 90 percent allowance recommended by the USGA equitable? Second, do teams with larger differences in handicaps between partners have an advantage? And third, what is the optimal handicap allowance for four-ball stroke play? Is the 90 Percent Allowance Equitable? - USGA recommendations on handicap allowances appear to based in part on the work of F. Scheid of the USGA Handicap Research Team. In a 1971 study, Scheid examined the net scores of players with various combinations of handicaps. His study was based on 50 players from one club. Scheid did not have data from a four-ball event. Instead he took the scores of these 50 players and simulated matches between them. Based on these simulations, Scheid claimed players should be allowed 107 percent of their handicap in four-ball stroke play competition. In 1971, however, a player’s handicap was computed as 85 percent of the average of his ten best scores. Today, that percentage has been increased to 96 percent. Sheid’s recommendation in terms of the current handicap system would be to allow players roughly 95 percent of their handicap. If high handicappers had an advantage in four-ball competitions a team’s net score would be expected to decrease with its handicap. A plot of tournament net scores illustrating such a bias is shown in the figure below. The b-coefficient in Model I is a measure of the inequity of the handicap. This coefficient is the slope of the line drawn in the figure above. If b were to equal -.1, for example, the model would predict that for every ten stroke increase in average handicap, net score would be expected to decrease by one stroke. If the coefficient were zero, then there is no correlation between handicap and net score which is the ideal situation. Estimates of this coefficient using data from various tournaments would indicate the magnitude and direction of the bias. The value of the b-coefficient of Model I was estimated with the data from the 1997 Southern California Golf Association (SCGA) Four-Ball Stroke Play Championship. The competition was conducted at four qualifying sites followed by two rounds at the championship site (i.e., six sample sites). Each player’s course handicap was computed using the 90 percent allowance. Five of the six estimates of the model coefficient are negative indicating a likely negative relationship between net score and average handicap (see Table 1). That is, even with a 10 percent reduction, higher handicap players had an advantage. In two cases (Menifee Lakes and Vista Valley), the hypothesis that the b-coefficient was equal to zero could be rejected at the 95 percent level of confidence. This research only raises the suspicion that the 90 percent allowance may not be equitable. Any conclusion has to be tempered by the data limitations which are serious and are discussed in the concluding section. If high handicappers had an advantage, the b-coefficient should be negative. And if larger differences in handicaps between players are advantageous, then the c-coefficient should also be negative. The c-coefficient is never statistically significant at the 95 percent level of confidence. In three cases the estimate of the c-coefficient is positive and in three cases it is negative. 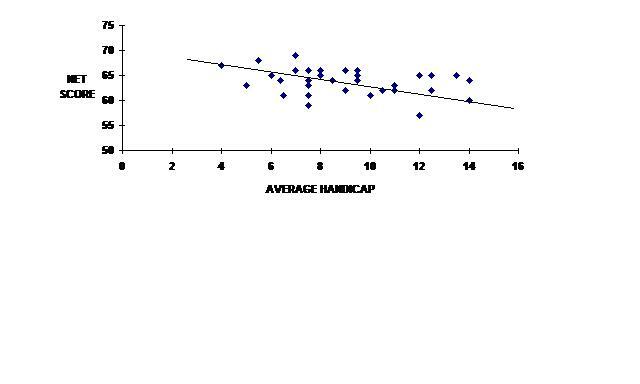 Within the limitations of the data, it is concluded that the difference in handicap did not have a significant effect on the net score of a team. The evidence for the b-coefficient is similar to that found in Model I which was expected. In two cases (Menifee Lakes and Vista Valley) the b-coefficient is both significant and negative. The size of the b-coefficient at these two sites indicates a large bias favoring the higher handicapped player. In the other four cases, however, the b-coefficient is not statistically significant. What is the Optimal Allocation for Four-Ball Stroke Play Competition? - As shown above, the 90 percent allowance did not lead to equitable competition at several sites. What allowance would have eliminated the correlation between net score and average handicap? To explore this question, tournament results were simulated using actual gross scores but varying the handicap allowance. An estimate of the b-coefficient was made for each allowance. The allowance that yielded an estimate of the b-coefficient nearest to zero was considered optimal. The simulations found the estimate of the optimal allowance differed widely among sites as shown in Table 3. The optimal allowance is shown as a point estimate in Table 3. In fact, however, there is an optimal range of allowances that yield little correlation between net scores and average handicap. For example, in Bear Creek Day 2, any allowance between 87 and 103 percent would have led an estimated b-coefficient of less than .1. Therefore, the USGA recommended allowance of a 90 percent allowance would give equitable results at four of the sites. At two of the sites (Menifee Lakes and Vista Valley), however, the optimal allowance is well below the USGA recommendation. It is impossible from this data to tell whether the results at these two sites are due to random variation in the optimal allowance or to anomalies caused by players (e.g., sandbaggers). An examination of the slope rating at these two courses did not reveal the size of error that could lead to the results presented here (See Appendix B). 1. Narrow Range of Handicaps - Handicaps in the championship flight at Bear Creek varied over the narrow range of between 4 and 20. Only about 14 percent of the field had single digit handicaps. A broader and more evenly distributed sample of handicaps is needed to have better estimates and to extend the results to the general population of golfers. 2. Error in the Slope Rating - An error in the slope rating could bias the estimate of the optimal allowance. For example, if the slope rating at Bear Creek was 128 rather than 136, handicaps would be overestimated by 6 percent. Players would actually be playing at 96 percent of their true handicap rather than the 90 percent allowance. 3. Limited Difference in Partnership Handicaps - The SCGA limited the difference in handicaps (after taking 90 percent) to five strokes. To better explore the effect of the difference in handicap between partners a much more varied sample is required. 4. Small Sample Size - Estimates of the b-coefficient were obtained at only six sites. To get a better understanding of the mean and variance of this coefficient, many more sites need to be examined. To mitigate these limitations, data should be collected from a number of four-ball tournaments held at clubs. These tournaments should be member tournaments and not member-guests or invitationals. This will minimize the slope rating error problem since handicaps would be based on scores (for the most part) from the same course where the tournament was played. These tournaments should also attract a greater diversity in handicaps and in differences between partners than the SCGA tournament. With data from say 20 clubs, estimates of the model coefficient can be made for a variety of handicap allowances. If a small range of allowance is consistently best across the clubs, then a recommendation on the allowance to be used in four-ball tournaments can be made with some confidence. The SCGA places two restrictions on the handicaps of competitors that do not contribute to the equity of competition. This appendix examines those restrictions and makes recommendations for change. Five Stroke Difference in Handicap Between Partners - The stroke limitation means that some qualifying teams had their handicaps reduced when they played the championship course (Bear Creek) where the slope rating was 136. Assume a team had indices of 9.5 and 15.4. At a qualifying site with a low slope rating, they would have handicaps of 9 and 14 (90 percent of their course handicap). At Bear Creek 90 percent of their course handicaps would be 10 and 16. The 16-handicap would have to be reduced to 15 to meet the five stroke differential. In essence, this player is playing at 83 percent of his course handicap, while most of his fellow competitors are playing at 90 percent of their handicap. To eliminate this inequity, the SCGA should place the restriction on the difference in indices rather than the differences in course handicaps. For example, the maximum difference in indices between partners could be set at 5.0. This would be easier for the players to understand, be administratively simple for the SCGA tournament staff to compute course handicaps, and would eliminate the inequity of players competing at different percentages of their handicaps because of the slope rating. Computing the Reduced Handicap - The USGA recommends taking 90 percent of a player’s course handicap for four-ball stroke play. It is suspected, however, that this recommendation was written before the advent of the Slope System and has never been revised. The USGA’s method contains two rounding errors. First, an error occurs when a player’s index is converted to an integer course handicap. A second error results when 90 percent of the course handicap is rounded to the nearest integer for the four-ball handicap. It is suggested that the SCGA compute a player’s four-ball handicap based on 90 (or whatever allowance is used) percent of his index and not his course handicap. This method is easier to compute and yields handicaps as close or closer to a player’s ability (as measured by the non-rounded course handicap) than the USGA method. The results at Bear Creek, Vista Valley, and Sierra LaVerne indicate the course slope rating is working according to theory (i.e., the estimated coefficients are not significantly different from zero). In the other two cases, Menifee Lakes and Soule Park there is some apparent bias in the results. High handicappers have an advantage at Menifee Lakes while low handicappers have an advantage at Soule Park. The estimates of the coefficients at these sites are nearly statistically significant at the 90 percent level of confidence. To lower the estimate of the b-coefficient to the range of the other sites (i.e., ±.09), the slope rating at Menifee Lakes would have to be reduced from 115 to 107. Similarly, the slope rating at Soule Park would have to be raised from 107 to 120. If Menifee Lakes was overrated that would help explain the bias favoring high handicappers at this site. Running a simulation at Menifee Lakes with a slope rating of 107, however, does not eliminate the bias as measured by the b-coefficient. The b-coefficient was still statistically significant. This methodology cannot say conclusively that Menifee Lakes is overrated and Soule Park is underrated. The research does indicate, however, the Rating Committee should review the slope rating at these two courses. USGA, USGA Handicap System, Far Hills, New Jersey, 1994. An argument could be made for reducing a player’s handicap for match play. A high handicapper will have his handicap based in part on hole scores that would not matter to the outcome in match play (e.g., a 9 on a par five). The USGA recommendation of lowering handicaps for stroke play and not for match play, however, does not appear to have a theoretical basis. In four-ball stroke play, two competitors play as partners. The lower of the partners’ scores is the score for the hole. Francis Scheid, “You’re not getting enough strokes,” Golf Digest, Trumbull, Connecticut, June 1971, p. 52. There is no obvious explanation for why scores at Menifee Lakes and Vista Valley behaved differently from other sites. If the slope rating at these two courses was overestimated, some of the bias could be explained. It would take an error of over 40 slope rating points, however, to explain all of the bias at Menifee Lakes. Another possible explanation is that Menifee Lakes had a disproportionate number of “sandbaggers” who had high handicaps. Qualifiers from Menifee Lakes were to take first, third and tie for fourth in the championship tournament. When these three teams were excluded from the Menifee Lakes sample, the b-coefficient in both models was no longer statistically significant. At Bear Creek, for example, the same teams finish in the top ten whether 90 or 100 percent of the handicap is used. For equity and administrative ease it is suggested the SCGA : 1) base handicaps on 90 percent of a player’s index and not 90 percent of the player’s course handicap, and 2) place the limit on the difference in player’s index and not on the difference in course handicap. Appendix A details the reasoning behind these recommendations. Assume a player had an index of 22.0 and was to play a course with a slope rating of 136. His four-ball course handicap with a 90 percent allowance would be 23.83 before rounding. Using the USGA method his four-ball handicap would be 23 (i.e. 26 handicap multiplied by .9 and round to 23.) Using the 90 percent of index method, his four-ball handicap would be 24. The 90 percent of index method yields a handicap closer to the player’s actual ability (i.e., 23.83). Stroud, R.C., Riccio, L.J., “Mathematical underpinning of the slope handicap system,” in Science and Golf I, E & FN Spon, London, 1990, pp. 135-146.